This page of FAQs about CIFE colleges answers the questions we are most often asked. Independent sixth-form colleges links to a page which describes how our colleges compare with the rest of the education sector. About CIFE explains what CIFE colleges have in common. 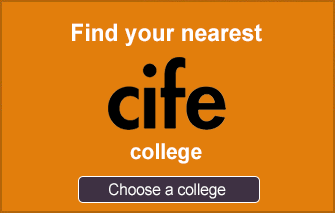 Where are CIFE colleges located? Acorn House, Ashbourne, Bales, Cambridge Tutors, CATS College London, Chelsea, Collingham, David Game, LSI, MPW, Regent and Westminster Tutors are in London, Bosworth is in Northampton, Brooke House is in Market Harborough, Carfax and Cherwell are in Oxford and MPW also have college in Birmingham and Cambridge. Cambridge Centre for Sixth-form Studies, CATS College Cambridge, Bath, Oxford International College, Oxford Sixth Form College and Rochester Independent College are named after the cities in which they are based. How do I know which college is best? There’s no easy answer to this question because it depends on the sort of person you are and on what you need. All CIFE colleges provide good courses, led by committed and experienced teachers. Small classes with regular examination practice and emphasis on study skills really helps students. Each college has its own atmosphere and you can only really find out what it’s like by visiting. The information below and on the Questions to ask CIFE colleges page explains ways in which CIFE colleges differ from each other. What do students achieve at CIFE colleges? CIFE colleges help their students achieve excellent results and half of CIFE college students get places at top universities. Most colleges provide detailed results information on their websites, and all will be happy to answer your questions about grades achieved and student destinations. One aspect of performance in which CIFE colleges do particularly well is ‘value added’: helping students do better than the grades that one might expect from their previous results. How can I be sure that CIFE colleges do a good job? CIFE was founded over 40 years ago to provide an inspection service for independent colleges, and although that role has long-since taken over by the state, CIFE remains highly focused on quality. CIFE colleges are all regularly inspected by the Department for Education. They are also inspected either by the British Accreditation Council, the Independent Schools Inspectorate, or both. Ofsted (Office for Standards in Education) check college-provided accommodation and student welfare. What are admissions procedures like? Colleges will expect you to visit for an interview in person or on-line. If that’s impossible many can assess you via reports etc. Interviews are not meant to be stressful, but provide the best way for the college to find out what you’ve done, and what your hopes are, and to work out with you the best pattern of courses. Take along your most recent school reports and examples of your written work to give college staff an insight into the stage you have reached. Colleges will offer you a place if they think that they can provide what you need. Of course, a visit is also the best way for you to find out whether the college is right for you (see our ‘questions to ask CIFE colleges‘ page). Can the colleges provide me with accommodation? It’s vital to have somewhere quiet, comfortable and safe to live while you study, particularly if you have to study away from home. The proportion of residential students varies from college to college. In some colleges most students live at home, but in others most are residential. Some colleges have accommodation on site or in a college-managed hostel nearby. Most colleges have a team of host families with whom they have well-established relationships. Colleges take their responsibility for supervision of accommodation very seriously and inspect regularly. Our advice article Choose the right accommodation looks at the options in more detail. CIFE colleges are independent, so rely entirely on student fees to provide the high staffing levels required by small groups and individual attention. Colleges mostly charge according to the number, type and duration of courses you take, so the variety of possible combinations means it is difficult here to give an accurate general fee. Our Fees at CIFE colleges page includes links to the Fees page on each college’s website. Colleges will of course be happy to give you a clear idea of the fees for the specific course combination you are considering. A significant proportion of students in CIFE colleges receive financial help from the college. Each college has its own criteria for whether to award help, but you will need to prove that you have exceptional ability and that you really can’t afford the normal cost of the course. You should apply to the college of your choice as early in the year as you can. Have a look at Help with fees at CIFE colleges for more information. Can I do A level in one year? Yes, but it’s very tough if you haven’t already spent some time studying at sixth-form level. It is possible to take all the the exams which make up an A level in one year and most of the CIFE colleges are able to help you do this in a wide range of subjects, including the new ‘linear’ format A levels. You must work hard and consistently from day one! Talk your plans through very carefully and listen to the advice you are given when you go for interview. Find out more on our One-year A levels at CIFE colleges page. Can I join a CIFE college for the upper sixth? Yes, roughly 10% of CIFE colleges’ intake are students who have spent the first sixth-form year in another school. CIFE colleges’ flexible timetabling, individual attention and ability to provide a genuine fresh start often prove ideal in revitalising a student’s prospects. There’s more about this on our Final-year A levels at CIFE colleges page. Can I change examination boards? Yes, for most subjects it is possible to change to another exam board if you move school half-way through the sixth form. However you need to check with your chosen college as not all subjects are ‘portable’. The introducion of ‘linear’ A levels, which started in Sptember 2015, reduces compatibility problems. See our article on the new A-level and GCSE exams for more details. How flexible are CIFE colleges' timetables? Very. Colleges offer wide choice of subjects subjects and most can do so without imposing any forbidden subject combinations. Colleges also allow students to mix course levels: for instance to take two subjects at final-year level and a third as a one-year A-level course. What's the benefit of taking an Easter Revision course? How can CIFE colleges help me with UCAS? CIFE colleges give really good advice on university entrance, ranging from help with choosing the right courses at university to the writing of the vital UCAS Personal Statement. This is particularly important if you are retaking exams, and CIFE colleges are experts in making sure your application has everything going for it. Students at CIFE colleges are a pretty diverse lot, united by their ambition to get the best education they can. Have a look at our student profiles page for some examples of CIFE college students. You won’t be the only new person starting at your college, and while it may take a few days to settle into the new routine, the small classes mean you will get to know other students very quickly. Colleges ensure that there is always someone with whom you can share any concerns or problems. Colleges also organise extra curricular visits and activities to provide you with another dimension to your studies and further opportunities to socialise. Can I keep up my sports interests? Yes. If sport is important to you colleges will encourage you to continue with it. They will help to make that happen, either via their own teams or through good links with local clubs and Leisure Centres. Make sure you ask about your favourite sports when you go for your interview so that you have a good idea about what the college can arrange for you. Do CIFE colleges welcome international students? Yes, do check our FAQs for international students page. It includes information about admissions, visas etc. While the proportion of international students in CIFE colleges varies from under 20% to over 80%, all CIFE colleges firmly believe in the importance of an international dimension in educating effective citizens for twenty-first century life. It is not only in the teaching of subjects such as Economics or Politics that the experience of international students can add thought-provoking ideas: all aspects of college life can benefit from a well-integrated yet diverse body of students. Small classes, individually-tailored programmes and (where needed) good language support, all enable overseas students to settle quickly, so that they add to rather than hold back their classmates’ learning. If you mean ‘are CIFE colleges exam orientated?’ the answer is ‘Yes’, but then exams are so central to education these days that this is true of virtually every school – CIFE colleges just happen to be very effective at getting good results. But if you mean ‘do CIFE colleges simply force-feed their students?’ we would say ‘No’. Even two-term A-level retakes, probably the most exam-centred courses CIFE colleges offer, pay more attention to skills and understanding than to the rote learning of facts. On longer-term courses CIFE colleges are as committed as any good school to providing an effective environment for students to grow personally as well as academically. Crammer, tutorial or sixth form college looks at why this variety of names exists. What does 'CIFE' stand for? CIFE is short for ‘The Council for Independent Education’. When CIFE first began in 1973 those same letters stood for ‘Conference for Independent Further Education’, then ‘Council for Independent Further Education’, but as CIFE colleges diversified, some to take younger students, the term ‘Further’ was dropped from the name. For more history, have a look at CIFE’s page on Wikipedia. CIFE has a permanent secretary (who you can contact via the details given on the Contact page), an Executive Council currently chaired by Tim Naylor (Principal of Bath Academy), and a variety of committees on which other CIFE Principals sit. The work of CIFE is supported by our President, Lord Lexden, and Vice-President, Hugh Monro. What if I am not happy with a CIFE college, or CIFE? If you feel that you have received poor service from a CIFE college you should first use that college’s complaints procedure to deal with your concern. If you are unhappy with the outcome of your complaint, you are welcome to contact CIFE about the problem. Either contact the CIFE Secretary or write to the Chairman, Tim Naylor at Bath Academy. The same applies if you have a complaint about CIFE itself. We hope you've found these FAQs about CIFE Colleges helpful - do let us know if there's more information you would like to see included.